The 100-meter dash may be the fastest event at the Olympics, but there is so much that goes on during those 10 seconds.  Here's a look at the science and technique in the race, along with the sprinters' views of those 100 meters. When getting into the blocks, author Warren Doscher writes in "The Art of Sprinting," the strongest leg should be in the forward pedal of the starting block .  The fingertips should be set just behind the starting line (not touching it)  with the arms mostly straight but the elbows unlocked . 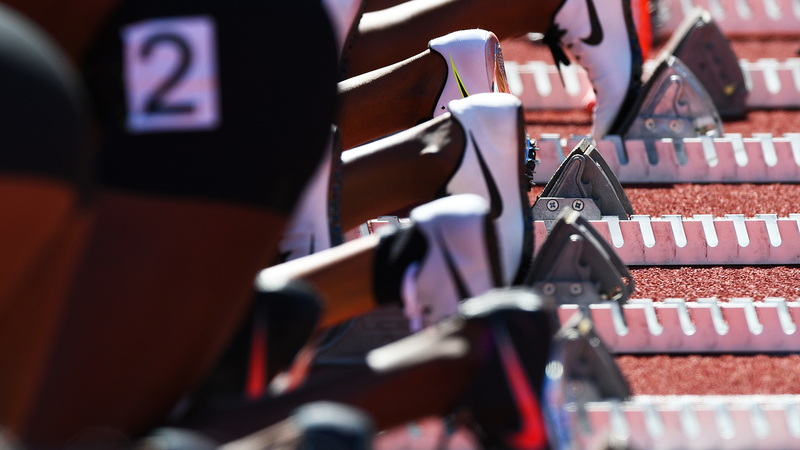 Apart from the men wondering how they might beat Bolt, there is one thing sprinters say they are focused on after they position themselves in the starting blocks. 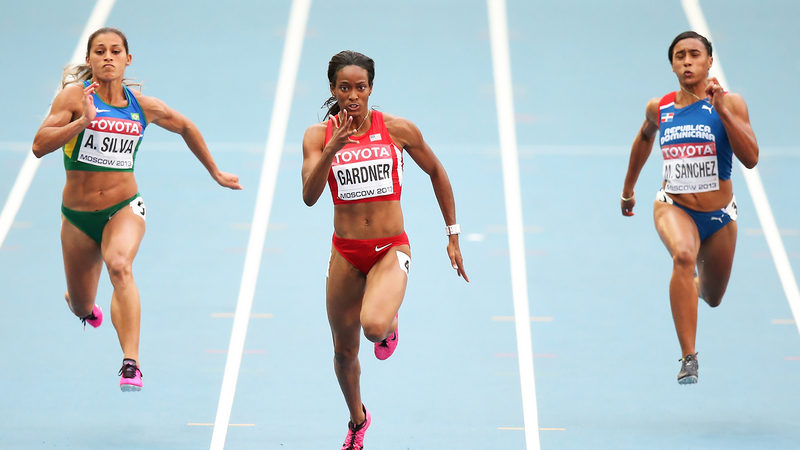 "Listen for the gun," says English Gardner, America's top female sprinter. "Nothing else matters but that. You can't do anything else until the gun goes off. The worst thing you can do is false start. It's one and done in our sport. I just try to listen for the gun and react." The rules used to be that you could false start once and be given a second chance. That was changed in 2003. You can even be disqualified if you start too soon after the gun fires. Research has shown that a person cannot hear the gun and react in under a tenth of a second. Therefore, if you start sooner than a tenth of a second after the gun, it will be considered a false start. And you're done. "A lot of races are won and lost because a sprinter does not react properly to the gun," says two-time Olympic 100 medalist Ato Boldon of Trinidad and Tobago. "You don't want to anticipate the gun; you want to react to it. There's a difference. If you anticipate it and you're wrong, you're going to be out." "You don't want to anticipate the gun; you want to react to it. There's a difference. If you anticipate it and you're wrong, you're going to be out." 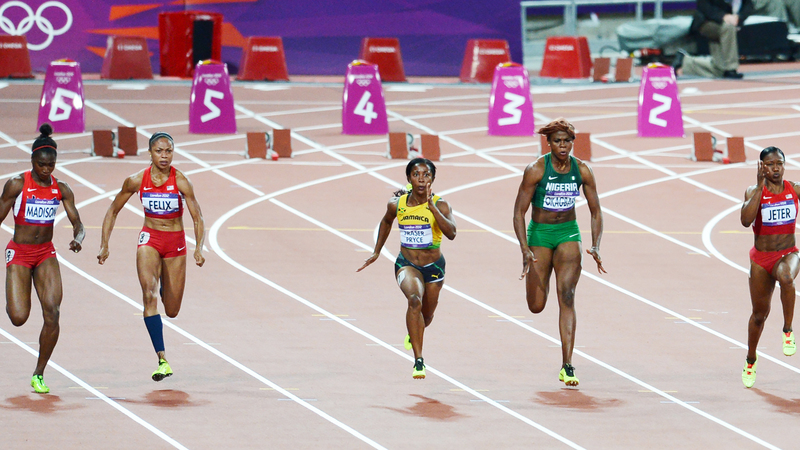 In addition to listening for that starter's pistol, Warren Doscher writes in "The Art of Sprinting," sprinters must make sure their feet are properly set and that the balls of their feet, ankles, knees and hip joints are in alignment. Their head should be down. They should take a deep breath and hold it. And then, they must react to the gun. There are various types of starts, including the jump and the "get up and go" starts that may put you out front initially but won't help you. Writes Doscher: "One can only accelerate forward when the foot is on the track applying backward force to it."  During acceleration out of the blocks, a sprinter will drive out in a 45-degree angle , moving his arms in opposite directions in a large range of motion  with one arm driving forward and the other driving backward. American Justin Gatlin says the start is all about instinct. "I'm like, 'All right, I'm waiting for the gun and getting set,'" says Gatlin, the 2004 Olympic 100 gold medalist. "If you're thinking, 'Are my arms too wide, are my arms too close together?' it's over for you. You just have to go on instinct. It's like blinking, like breathing." Less experienced runners might try to rise up quickly and take quick steps to put themselves into an early lead, but two-time Olympic 100 gold medalist Carl Lewis differs. He says the key is not to take immediate quick steps, but to take longer, more powerful strides because that will help you farther along in the race. "If your car runs out of gas, you don't go ahead and pull it," Lewis says. "You get behind and push it. And when you push it, you stay on the first step and extend all the way until the next step. And all the way until you extend to the next step. And that's how you get out of the blocks." "That's exactly what I tell my young kids," says Boldon, now a track and field analyst for NBC Sports who also does some coaching. "If you have to push something heavy, you're not going to push it from a 180-degree angle. You have to get some relative angle to the back of that car. You're trying to overcome inertia and gravity in the first part of that race." By now, the sprinters have pushed hard to get themselves moving, and hopefully they are more of a Ferrari than a Ford F650 truck. It's time to start speeding up without standing up too tall, too quickly. "You don't want to rush your transition and snap your head up, because you have all this good momentum going forward," Boldon says. "You want to slowly but surely stand up to your upright running position. "You want to relax your head and stay low in a pushing position so your first 10-15 steps, which will get you to 20-25 meters, will be low, efficient and powerful."  The total strides in the 100 range from 40-41 for Bolt to around 50 for the top women. Doscher writes that to lessen the braking effect of the foot when runners step on the ground, they should have their knees slightly bent when doing so. In "Sprinting," author Ryan McGill says the runner should keep ground contacts as "bouncy" as they can, comparing it to running across hot coals. 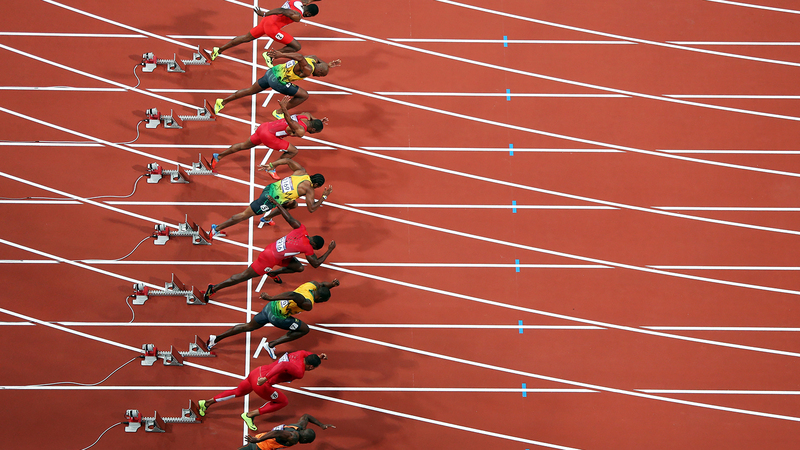 At this point, sprinters will generally have completed the start phase and will now be in the full running phase. Keep the body as relaxed as possible with shoulders down, leaning forward to maintain balance . Feet land under hips with no overstride or excessive braking. There should be no wasted energy through torso rotation . 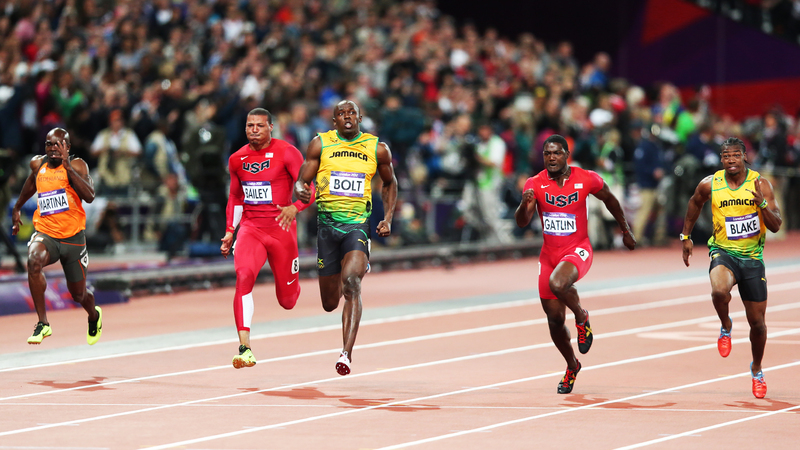 The length of the stride can be more important than the quickness, which is one reason Bolt, who is 6-foot-5, is so fast. But just because you aren't tall doesn't mean you still can't be fast. Trayvon Bromell is 5-9, but he was the first junior sprinter to beat the 10-second mark in the 100. He also finished second in the U.S. Olympic trials in 9.84, just four-hundredths of a second behind Gatlin. "I said in the third grade that I wanted to be an Olympian, and people laughed at me," Bromell said afterward. "Now I'm here." Regardless of height, top sprinters will begin to reach their top speed shortly after reaching 30 meters in the acceleration phase. "It's the fastest part of the race," Boldon says. 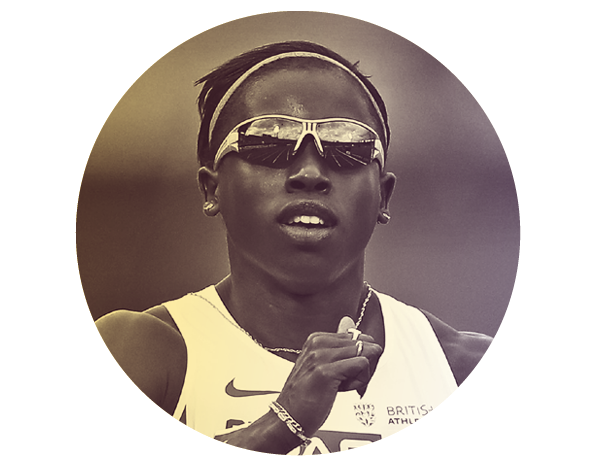 "Where you're going to get to your absolute top end speed, for most sprinters it's from 35 to 55 meters in the race." One important aspect of the 100 is to always stay focused on yourself and the track ahead of you. Glancing to your left or right to see where your competitors are will only slow you down. "You should be able to run 100 meters like a horse in the Kentucky Derby with blinders on," Boldon says. 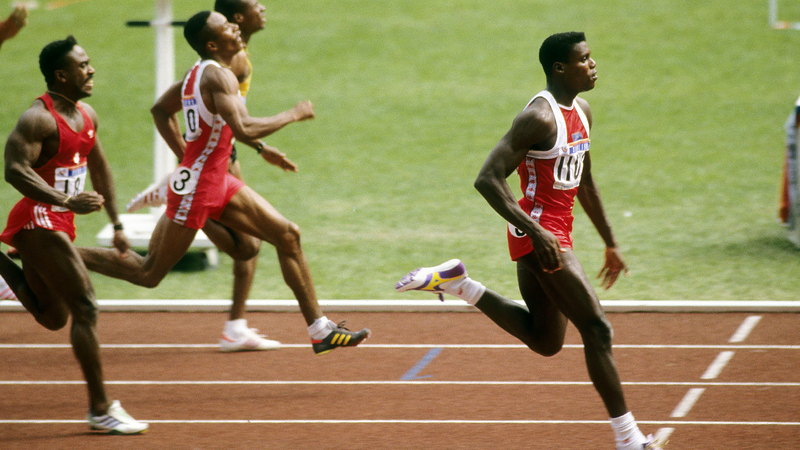 "Nothing in the 100 should ever cause a sprinter to look to his left or right." Boldon knows that full well. He glanced over to Namibia's Frankie Fredericks in the 1996 Olympics and fell behind him, which got him bronze rather than silver. "I know more than most that you can do it," Boldon says, "but you have to spend the rest of your life telling people why it cost you a medal in the Olympic Games."  Runners will be at peak speed halfway through the race. Stride length is generally more important than stride frequency .  Usain Bolt's stride is about 8 feet per step. At this point, the sprinter is at his peak. He is upright and also running his fastest. How fast?  The best will be running at 25 to 26 mph. In his book, Doescher says that in addition to keeping the body in alignment, the arms should be swung to the rear, with elbows slightly away from the sides and no arm crossover. What is it like halfway through the race? "It's a lot like driving," Gatlin says. "When you're driving, you understand what you're doing, but you're checking the mirrors, where you're at. 'OK, turn, turn signal.' It's like you're going through the checks and balances of what you need to do to get down the race. So it's the drive phase. Come out of the drive phase, run, stand tall, keep going." Gardner says she doesn't remember what goes on in her head at this point in the race. "I'm in another world," she says. "That's when my alter ego takes over. I'm not even there anymore." She's there, she's just focused on running. And winning. Gatlin says that at whatever speed he has reached at 60, "That's all I can hold. So I just have to bluff my way through. I need to get my way out ahead of the field. And hold on." All sprinters will slow down by this point. In addition to maintaining proper technique to keep from slowing too much, Ryan McGill, author of "Sprinting," suggests that sprinters should wear sunglasses if the sun is out because squinting can slow you even more. When you watch a 100-meter race, you might think that a sprinter pulling away near the end is gaining speed on everyone. That is not the case. Everyone slows down by 70 meters, if not earlier. Boldon says the belief that some are able to get faster at this stage is a myth, or at least an illusion caused by seeing someone pulling ahead. "Everybody in that last 35 to 40 meters is decelerating," Boldon says. "If you see somebody pull away, it's because they are decelerating less than the others. But everybody, no matter who they are, as long as you are a human, you are decelerating in that last third of the 100." It isn't that dramatic a drop -- Boldon says the best will slow down by maybe 2 mph - but it is enough to make the difference. "At 70 meters, you've got to maintain and keep those knees up," says Bromell. "People tend to get to 70 and think, 'Oh, I'm going to kick it into another gear,' but that doesn't happen. You actually end up pressing and slow down even faster." All sprinters will slow down by this point. In addition to maintaining proper technique to keep from slowing too much, Ryan McGill, author of "Sprinting," suggests suggests that sprinters should wear sunglasses if the sun is out because squinting can slow you even more. While sprinters are not supposed to look to their left or right, Boldon says at this point, they can begin to rely on their peripheral vision. "So your peripheral vision becomes a real factor. Now you have to assess, 'Am I leading? Am I second? Am I third?' You have a mental decision to make. All this is being processed in minute fractions of a second." Especially since you are getting close to the finish. 5.8 Seconds: Time it takes a cheetah (64 mph) to cover 100 meters. Sprinters occasionally make terrible mistakes at this point. 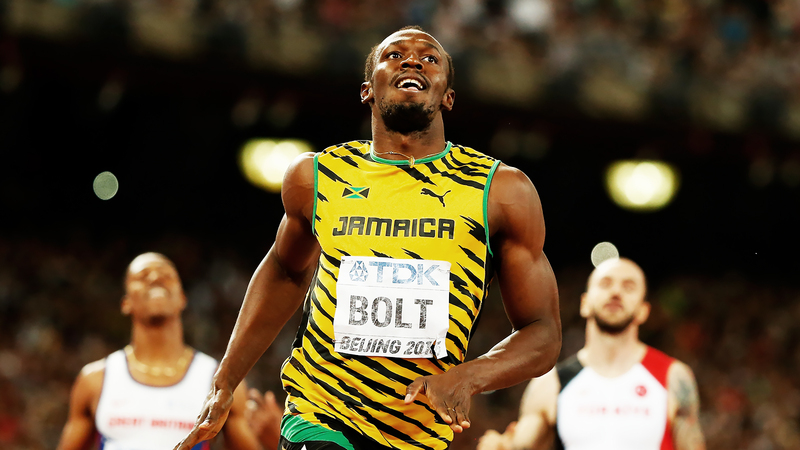 Gatlin did at last year's world championships in Beijing. He was in the lead and had a chance to finally beat Bolt. Then he stumbled slightly, his arms began to flail and he lost to Bolt by an eyelash, 9.79 to 9.80. 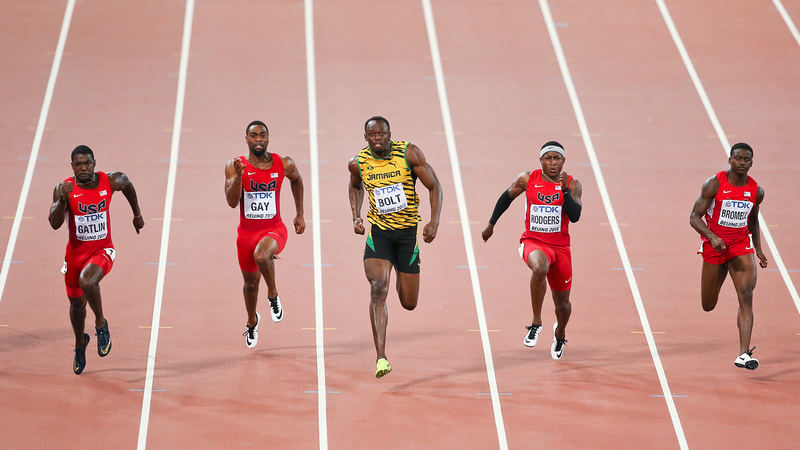 Gatlin says that's what caused him to lose that race: "You get caught up in the excitement, you want more, you try to go for more, and you just lose yourself. You need to stay calm and run to the finish line." 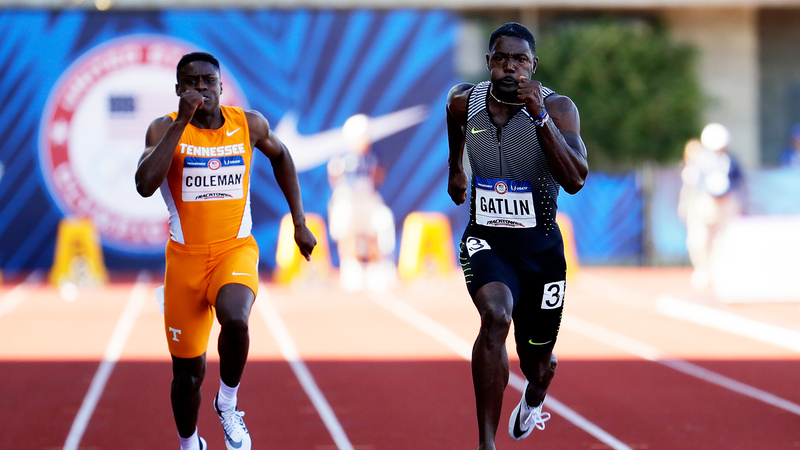 "Don't get greedy," Gatlin says. "Theoretically, man is not supposed to run faster after 70 meters. So after 70 meters I have to be sure I'm running strong, running tall and getting to the finish line. If I get greedy and start searching for something else, then I'm losing all my technique, losing my balance. Going forward, going back, arms are flailing; you're reaching for something that's not there. You're already there. And it's like you're reaching for more. And once you're up there trying to get it, you're going to fall down." Lewis says the key is staying relaxed. "That's the hardest part of the 100 meters," he says. "You need to stay relaxed and let the finish line come to you." Gardner says that when she is running, a lot of times she gets into a zone where she doesn't see or hear anything from her competitors. Not until right before the line. And that's when, she says, "I kind of snap out of it. 'OK, lean!'" Because times are based on when the trunk of a sprinter's body crosses the line, leaning your body forward to that line can help you win. But if you lean too early, it also can make you lose. 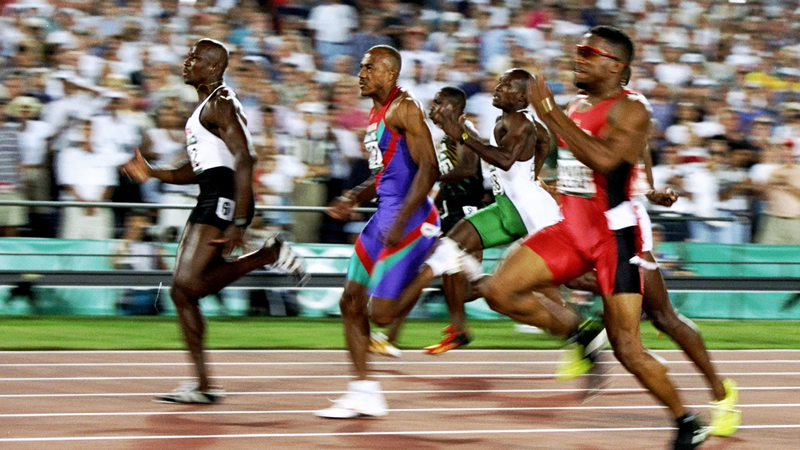 "Most sprinters lean too early," Boldon says. "You should lean on top of the line. A perfect lean comes almost when you are able to put your foot on finish line. Most guys who are falling apart form-wise or just desperate for the finish line will lean about a meter or two too early. So I try to tell my athletes, lean on top of the line as opposed to leaning to the line. "If you lean too early, you actually rapidly increase your deceleration, and you've done more harm than good. So a lot of times an early lean will cost you the race rather than win you the race." In other words, you do not want to do anything that will slow you down further.  You want to cross the line at the fastest speed possible. So lean at the very end. And then hope you somehow beat Bolt, who might already be getting ready to do his bow-and-arrow victory pose.